Fritz Reiner conducts the Vienna Philharmonic Orchestra. This Strauss recording uniting RCA star Fritz Reiner with the Vienna Philharmonic (one of Decca's star orchestras), was released in 1959, marking the first fruit of an agreement that in return for loaning RCA some of their artists, Decca was permitted to distribute RCA recordings throughout the U.K. and Europe. In addition, Decca agreed to record under license some of their own artists, in sessions paid for and sponsored by RCA, for release on the Red Seal label. High Fidelity, at the time of the original release, called it "as fine an example as we have of Reiner's preeminent place among the living disciples of Richard Strauss." 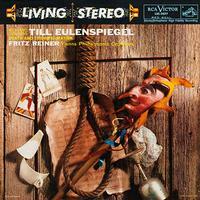 Recorded by Decca engineer James Brown in Vienna's Sofiensall, the sound is as tubby as a Bavarian burgher. The playing is, as advertised, first-rate.